I'll be on a mini break by the time this post gets published. I will be joining a few fellow bloggers for the Peñafrancia Festival 2013 in Naga City, Camarines Sur this weekend and naturally, I'd like my nails to match the occasion. I wanted 2 things -- a colorful nail art design and that it should be easy to do because I was pressed for time. Yes, I only had time to do my nails the night before my flight. Talk about cramming!! I simply called this "Crazy Lines" for the lack of coming up with a more quirky name. But its colorful, cheerful (? ), and absolutely easy to do. There's no pattern really. This is spontaneous painting of lines and blocks. It was surprisingly fun to do, actually. I wanted the colors to pop up so I decided to use Dazzle Dry Midnight Express, a very black opaque polish. This is one coat. Yes, it is! This is the only black nail lacquer that I've tried that can actually do this. I chose to use bright acrylic paints for the nail design and a dotting tool to draw the lines. A nail art brush would have been my usual choice but I took my chances with a dotting tool because I wouldn't have to worry about painting precise lines. Using a nail art brush would have driven me crazy and would definitely consume more time since I would be too careful to paint perfect lines. Have you ever experienced something like this? 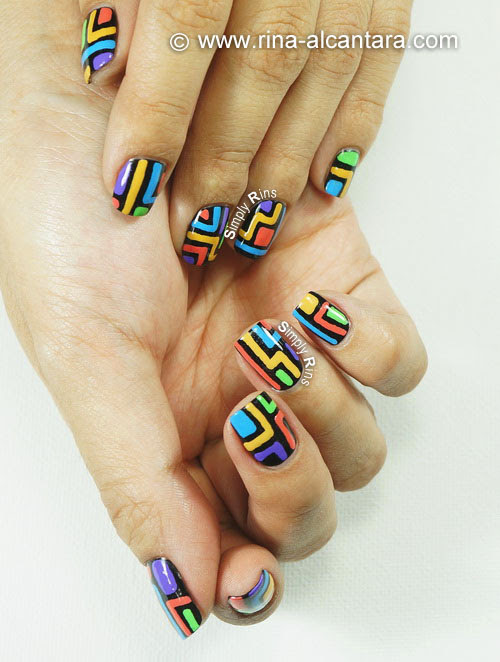 There are five colors in this abstract nail art design -- light green, mustard yellow, light blue, peach, and light purple. The choices of color combination will depend on your mood and preference. 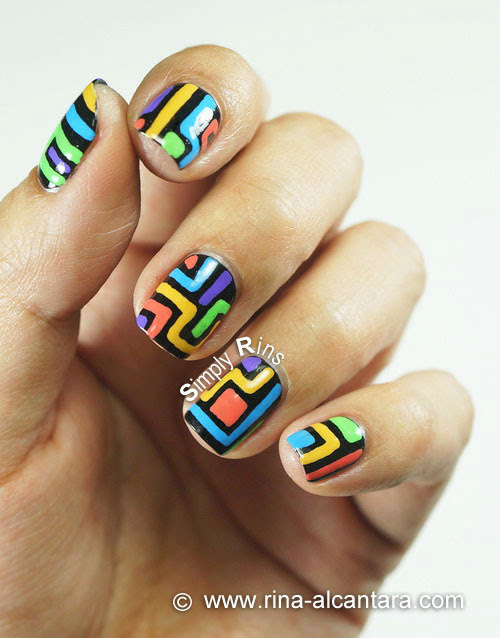 This makes this nail art very versatile. I'm also thinking that perhaps a white background will also work with darker lines. Now why didn't I make an accent nail with this idea? I would recommend this design to nail art beginners. It is easy to do using a dotting tool and also manageable when working with your non-dominant hand. It doesn't look rushed at all! Great colors and totally reminds me of pacman or tetris!